These words, spoken by Kent Wong, head of the UCLA Labor Center and one of the founders of the Asian Pacific American Labor Alliance (APALA), in the convention hall at APALA’s 25th anniversary convention in Anaheim, California. At the convention, which received the second delegation from the All Okinawa Council (led by Councilor Yoichi Iha), a resolution showing solidarity with the people of Okinawa, and opposing new base construction in Henoko and Takae, was passed to the applause of over 600 participants. A similar resolution was also proposed by Wong in 2015. His involvement in the base construction problem began when visiting Henoko on the invitation of Okinawan labor unions. Wong was moved by the sight of continued demonstrations outside the gates of the base, day after day. “In the home of the peace-loving Okinawans, powerful forces move to expand bases, yet the people on the small island continue to protest the Japanese and U.S. governments, two of the most powerful in the world. Now more than ever we must show our solidarity for peace,” said Wong. 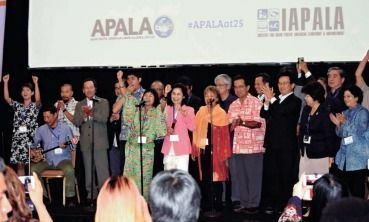 With just over 20 chapters in the U.S., APALA is a labor union that brings with it the influence of around 660,000 voices. Around 70% of its members are immigrants from the Asia-Pacific region from countries such as China, South Korea, and Vietnam. The Trump regime has expanded policies that oppress the rights of labor unions and immigrants, and has emboldened the actions of racist organizations. At the convention, protesting against Trump and racism were major themes. The convention also passed a resolution in opposition to the administrations proposed border wall. Wong’s speech was echoed by many others at the convention. Darren Shiroma, a fourth-generation Okinawan whose father’s side hailed from Nishihara, spoke after a separate meeting held by All Okinawa. “My grandparents thought of Okinawa with pride, and it had a great influence on my values, ideals, and beliefs. The costs of the new base construction are being paid by U.S. tax dollars. Edisa Adams, of Philippine and Fukuokan Heritage, felt great anger at the sexual assault by U.S. military reported at the All Okinawa meeting. Taking with her from the meeting a DVD and pamphlet from Okinawa, Adams said she would, “tell people back home about Okinawa, and that they must act now,” and that she would strongly call Congress to action in her role as the representative of a labor union with over 10,000 members. The Americans empathetically regarded Okinawa’s problems as “our problem as well,” as democracy’s power for action was on full display at APALA. Councilor Iha commented, “I want to use this resolution to lobby the Japanese and U.S. governments to action. ” The power of the people crosses international borders, and is driving calls to political action in both Japan and the U.S.